We can produce a wide variety of forensic rulers for various applications. They are used in teaching forensics and in the field at crime scenes. 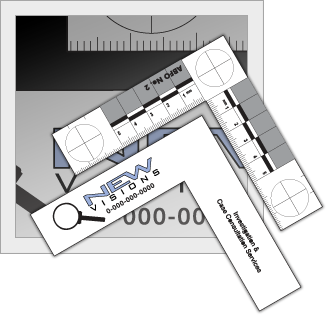 This right-angle ruler with black, white and gray scale is used when photographing crime scenes or evidence. The imprinted rulers give scale to the photographs. Crime labs, police, fire and sheriffâ€™s departments use these items as well as private investigators and insurance adjusters. 4.15" x 4.15" x .030"